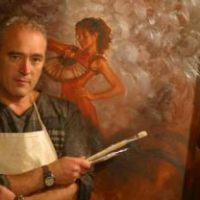 Mark Spain had a strong interest in art from a young age; attending Medway College of Art where he trained in technical graphics. On graduating, Spain set up his own print studio in Kent where he produced original etchings and collographs. He exhibited his figurative, abstract and landscape works extensively across the UK, including shows at the 20th Century British Art Fair, the Chelsea and Hampton Court Show and the Barbican Contemporary Print Fair. As time went on, the artist began to experiment with different forms of imagery, also exploring a wider range of media. His figurative oil paintings were extremely well received, and he was quickly signed to one of the UKs leading publishing houses. His first Limited Edition release sold out in record time, and soon after he was awarded the Fine Art Trade Guild Award for Best Up and Coming Artist. His work now hangs in galleries and private collections as far afield as Japan, New Zealand, Canada and the US. A vigorous and creative artist, Spain continues to experiment with different techniques and subjects, recently incorporating cityscapes within his figurative works. My main goals are always to create a certain amount of movement within the image, with particular emphasis on setting a mood and atmosphere.